For Rathnamma and Ramalingam, life took a turn for the worse when their 8-month-old baby fell sick suddenly. Their baby boy was perfectly healthy, until two months ago. They wonder if he fell sick when he was given a cold-water bath one winter morning. He contracted a cold that didn’t get better for a week and then he started wheezing. They had no idea that what started as a simple cold would land their baby in a hospital, fighting for his life. 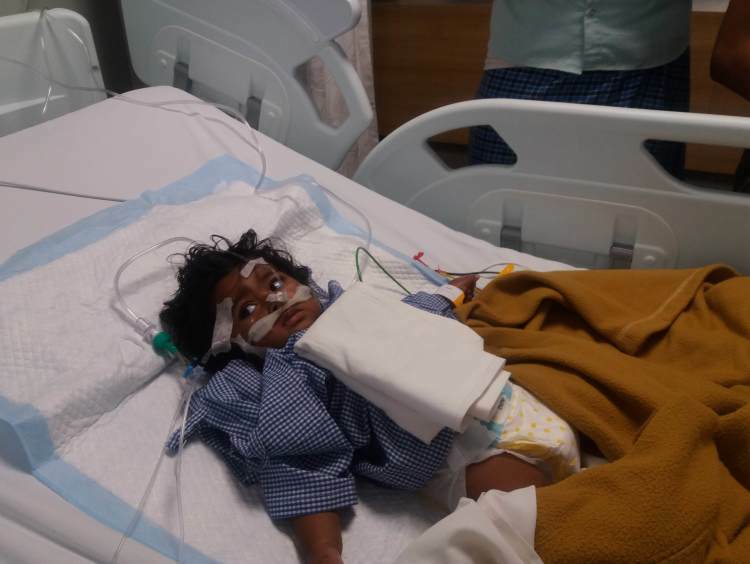 When their baby boy continued to wheeze and cough constantly, they took him to a hospital in Anantapur. They thought the doctors would prescribe some medicines and their little one would be fine in no time. What happened at the hospital though, shocked them more than anything. The doctors told them that he needed to be admitted right away since he had Pneumonia. “They said he’ll get better, but that didn’t happen. For a whole week, they treated him with no luck. 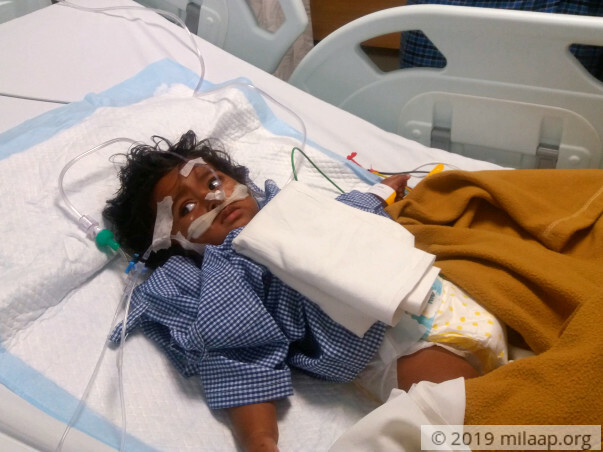 His condition worsened and they told us that they didn’t have the necessary facilities needed for his treatment and that we needed to take him to a bigger hospital.” says Rathnamma. 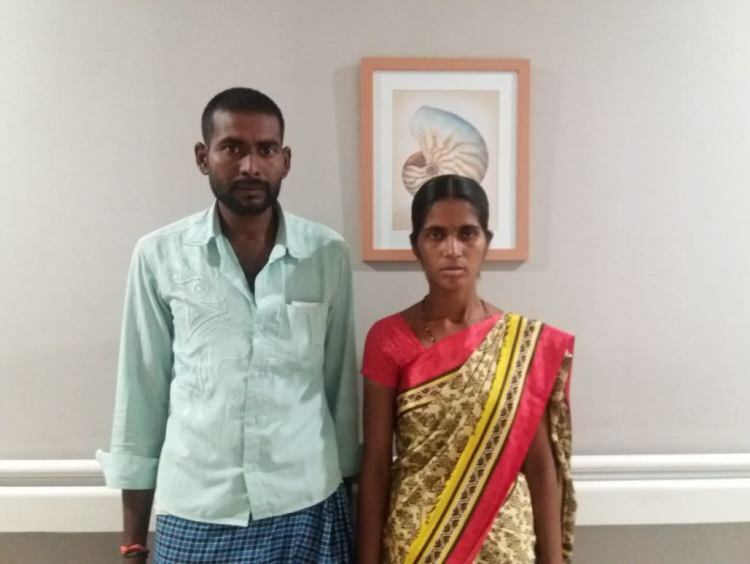 Their ordeal didn’t end at the Anantapur hospital. He was kept there for a week, under constant monitoring and medication. But his condition continued to worsen and he struggled to breathe even more. Then the doctors asked the desperate parents to take him to a bigger hospital, which would have the facilities for his treatment. Rathnamma and Ramalingam had no choice but to rush their little boy to a bigger hospital. They took him to Aster CMI Hospital, Bengaluru, where he is currently being treated. As soon as he was admitted to the hospital, he was put on oxygen, to aid him in breathing. The tubes bother him a lot and he keeps trying to get them out of his face. He cries out of pain when he coughs too much, and the crying worsens his breathing problem. His parents can’t do anything to take his pain away and it breaks their hearts to see him suffer this way. Rathnamma and Ramalingam fondly call their baby boy Bangaram, which means gold. They had such dreams for him and his life, and all that changed with him falling ill. They still can’t believe that fate dealt them such a bad hand. Watching their baby struggle to breathe is the hardest part of their lives, but they’re determined to save him at all costs. The only problem they now face is the lack of funds. Ramalingam works as a daily wage labourer for a meager pay. Rathnamma used to work too, but she stopped in order to take care of her two kids, Bangaram and her older son Yashwant, who is just 3. In the measly income that Ramalingam makes, they barely manage to get two meals a day. Affording this expensive treatment is way beyond their means. They have already spent close to Rs 2 lakhs towards Bangaram’s treatment, by taking loans from friends and relatives. The parents have now run out of money and sources to borrow from. To save their child, they need your help. Your contribution can help him recover and get a second chance at life. Thank you for all the love and support you have shown towards baby of Rathnamma. The baby has undergone the treatment and has been discharged. The baby has shown good signs of improvement and is recovering at a good pace. 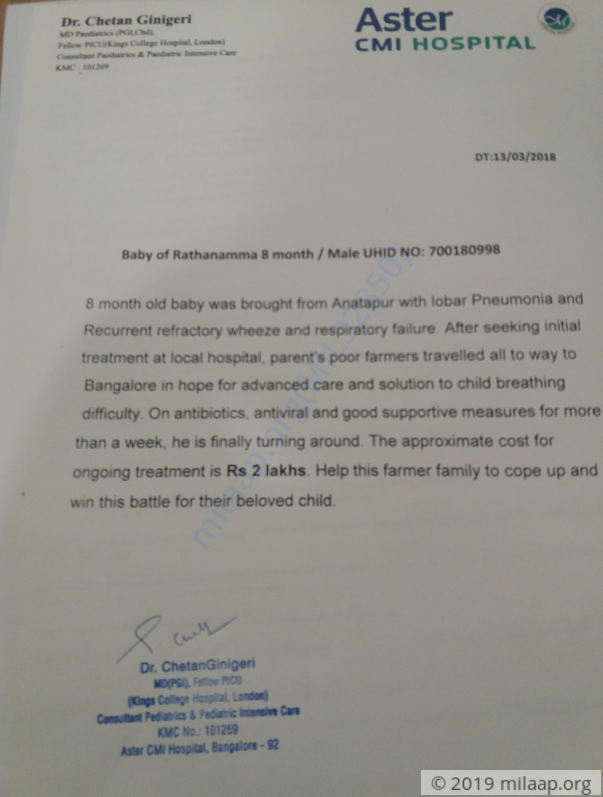 Thank you so much for the tremendous support you have shown towards Baby of Rathanamma. The baby received all the necessary treatment and is doing much better. The baby is discharged from hospital and doing the normal follow-up now. We are very hopeful for his complete recovery. Thank you for all the support.